Below you will find two different versions of our unique 2 Team Dream Pool. The first has 64 Squares and the second has 256 squares for participants to write their name in. 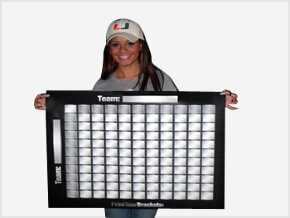 The gray squares will represent all of the teams in the NFL. The square that intersects the two teams playing in the Super Bowl wins. Full instructions on running this pool can be found at the bottom of this page. This pool is designed to start before the first game of the NFL season(but, since the team names are drawn blind, it can be started at any point during the season). 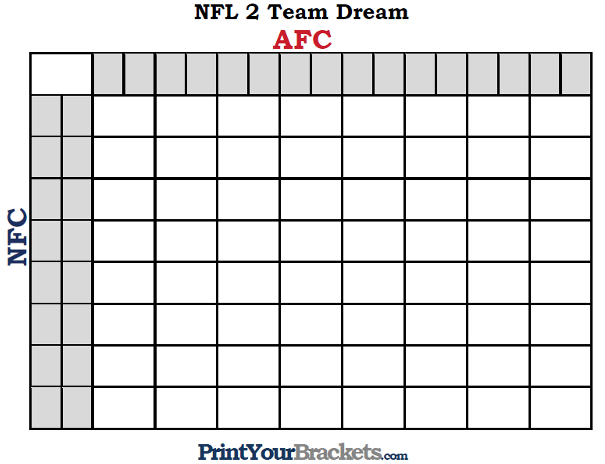 We have simplified the drawing by providing this Printable List of NFL Teams. Simply print that paper, cut the team names out and put them in a hat. This pool is somewhat similar to the Super Bowl Squares office pool. One major difference being this grid has either 64 or 256 squares in the middle, along with 16 gray squares across the top row and 16 gray squares down the left side. The gray squares represent each team in the NFL(AFC on top, NFC down the left side). The object of this pool is to try to get the square with your name in it to intersect the two teams that will be playing in the Super Bowl. The grid that has only 64 squares uses the same idea as our 25 Square Football Pool, each white square will actually intersect two teams from the AFC and two teams from the NFC. Take the grid around to family, friends, and co-workers, having each person place their name in the square or squares of their choice. *It is important to fill in the person's names before the team names, this makes it fair for all participants. Once all of the squares are full it is time to set up the drawing. Simply place the name of each NFL team on individual pieces of paper and put them in a hat for the drawing(you can do all the teams at once or you can do one conference at a time). Draw the team names one at a time placing them from left to right starting with the first gray square box in the top row(if AFC team), or top to bottom gray square boxes if NFC team. Do this until all of the team names have been drawn. 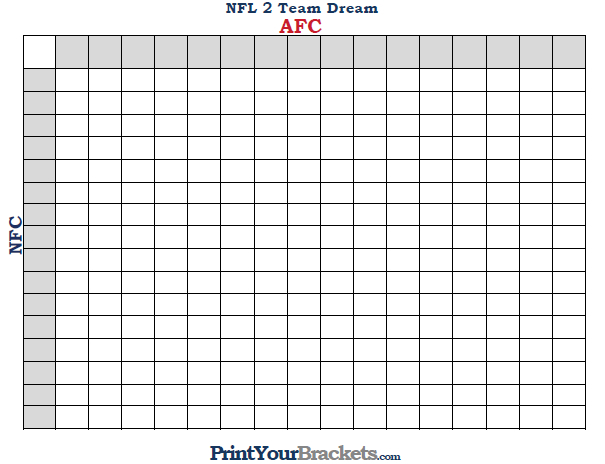 Once the Super Bowl matchup has been set, simply find the AFC team in the top row and the NFC team in the left hand column, see where they intersect on the grid and the person with his/her name in that square wins. 1. If you would like to have more winners, you could also use the squares that intersect the winners of each Division. So, you would find the square that intersects the AFC North and the NFC North, AFC South with NFC South ect..
2. Another option is to use the matching playoff seeds. So, you would find the square that intersects the AFC 1 Seed and the NFC 1 Seed, AFC 2 Seed and the NFC 2 Seed ect.. This would create and additional 6 winners.